Caring for and Washing Cloth Diapers Mama Say What?! | Mama Say What?! For some, the thought of washing a poopy diaper in the same machine you wash your clothes can be daunting. However, it really is simple and quite difficult to mess up, actually. In general, most mamas prefer to use a dry pail to store cloth diapers between wear and wash. A dry pail is exactly that — an empty, covered pail or a bag. Some mamas do prefer to use an uncovered pail, though. There are a couple different ways of storing. You can separate your diaper into pieces (for example, taking the insert out of a pocket diaper or taking the cover off of a pre-fold) and throw them directly into the pail, or you can rinse them out first. Some pocket diapers even have the feature where the insert comes out by itself in the washing machine. All of this is, of course, after using a diaper sprayer or another method to remove the solid waste from the diaper. My husband and I have found that a quick and simple rinse in the sink prevents any potential odor from wet diapers sitting for too long in the pail. If you do notice a problem, though, odor can also be controlled by sprinkling baking soda on the particularly smelly diapers or on the bottom of the dry pail. If you purchase a diaper bag specifically for dirty diapers, many come with a place for you to put in a drop or two of a sweet-smelling essential oil to mask the smell. For a dry pail, you can purchase a dirty diaper bag made specifically for storing dirty diapers, or you can use any other type of pail. My husband and I bought our pail at Ikea. It is hard plastic and easy to clean out in the bathtub. It has a flip lid and stands about knee high. I believe it is designed for paper waste, but for us, it works well for diapers. We store the diaper pail underneath our sink, where it is not noticeable to guests yet still within arms reach of the sink. Alternatively, I’ve read about mamas using a “wet pail” to store their diapers. This is basically a large pail filled with water and a bit of baking soda. Mama or dad throws in the soiled cloth diaper and lets it sit and soak until washing time. However, I don’t know any mama who actually uses this method. It’s often skipped over because of the smell of the soiled diapers in the stagnant water, as well as the mess of emptying the pail before washing time. Every other day, we wash our cloth diapers. Depending on the number of diapers you own and how many children you are diapering at a time, you might have to do a load every day. Most mamas that I know wash every other day as well. First, do a cold rinse. Simple as that, it only takes 20 minutes on my washing machine. When the rinse is finished, add some soap (only 1/4 to 1/2 of the manufacturer-recommended amount of detergent) and wash your diapers on the hottest setting your washing machine allows. The cold rinse is to remove any waste sitting on the top most layer of the diaper. The cold rinse will also help prevent staining. The hot wash is to thoroughly clean the diapers. Often, I set my washing machine to do an additional rinse at the end of the wash cycle. This isn’t necessary but helps me to have to strip my diapers less often. (More about diaper stripping below). 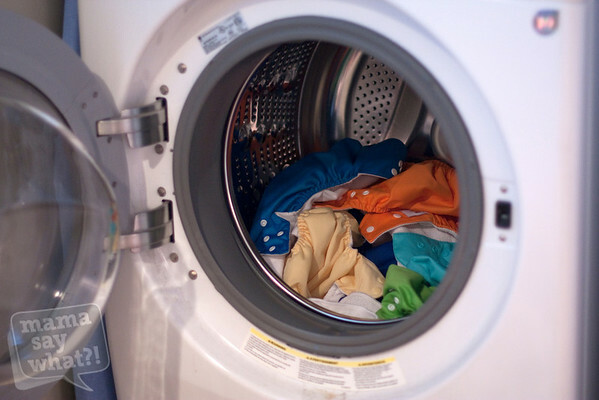 Many manufacturers recommend setting your washing machine to do an extra rinse about once a week. When your diapers come out of the washing machine, they should smell completely clean and fresh. You can choose to throw your diapers into the dryer or, preferably, hang them on a drying rack in the sun. However, please check and follow the drying instructions for your particular diaper brand. Some diaper manufacturers recommend you only line-dry the diapers, while others say it’s okay to use a dryer. 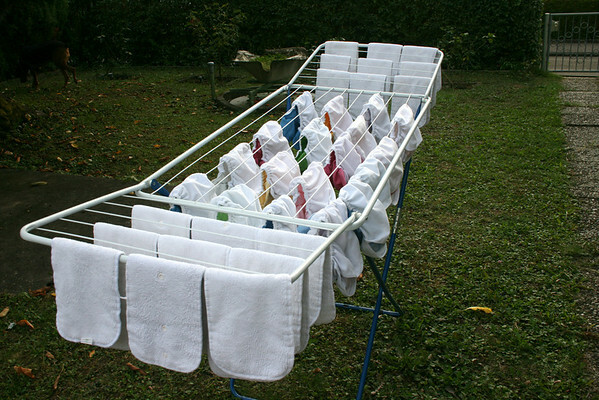 Drying your diapers in the sun on a drying rack or line is very beneficial to your diapers, and to your energy bill. If you are using cloth diapers in part to save from throwing disposables into landfills, you can make washing them most energy-efficient by sun-drying. You will cut your electricity bill by forgoing the dryer, for one, but the sunshine will also help rid your diapers of stains and odors. Drying your diapers in the sun will also help to extend the life of your diapers, as they will experience fewer chemicals and less wear and tear than putting them in the dryer. Choosing which detergent to use can feel like a battle until you find one that works for you and your baby. Many babies have sensitive skin and need diapers washed in a detergent that is gentle on their little bottoms. Also, depending on your city’s water quality and the type of washing machine you have, certain detergents might not be good for your diapers. There are many detergents on the market made specifically for washing cloth diapers, but many every-day-use brands work well too. You’ll want to use a detergent that leaves no residue on the diaper and a detergent that includes no whitening enzymes. For us, it was a trial-and-error process. We finally settled on Persil Sensitive unscented liquid detergent, and it works perfectly for our cloth diapers. This is a great chart provided by The Diaper Jungle about which common detergents are best for cloth diapering. Every once in a while, you’ll want to strip your diapers. 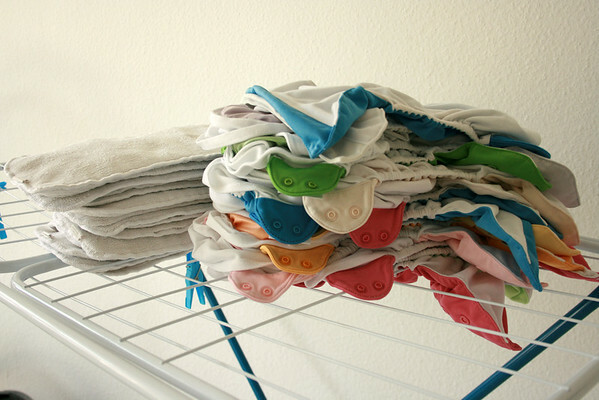 Using detergent can cause a slight build-up of chemicals in the diapers. This can cause your diapers to repel water, leak when baby wets the diaper, or cause the diapers to start to smell. You might also notice a slight rash on babies with sensitive skin when the cloth starts to have a build-up. Stripping your diapers will solve these problems. Don’t stress — it sounds scarier than it is. Essentially, stripping is washing your diapers, then rinsing, rinsing, rinsing and rinsing some more. First, wash your diapers regularly. Then, wash them again without soap in the hottest water your washing machine is able to provide. Many mamas even specifically turn up the water heat in the house to strip diapers. Re-wash in the extra-hot water multiple times, at least two to three times. At the very end of each rinse, peek into your washer and see if there are any suds left. Be sure not to confuse soap bubbles with agitation bubbles, though! Agitation bubbles are fine, but if there are any soap suds left, set your washer to another hot wash without any soap. For a top-loading washing machine, simply open the lid and peek inside to try and spot suds. For a front-loader, you might have to use a flashlight to see directly into the machine. Continue doing this until there are no more soap suds left in the rinse water. This can take two times for some diapers and can take four to five times for others, depending, in part, on your detergent and water quality. As always, sun-drying your diapers is best, but this is especially important after stripping your diapers. If the only time you ever sun-dry your diapers is after stripping, that’s okay too. If you have a particularly stubborn stain, try spraying some lemon juice directly on the stain after a wash and before putting the diaper out in the sun to dry. You can literally watch the stain disappear! Once the diaper is dry, rinse or wash it again before putting it on baby’s skin. Note that you should always follow the manufacturer’s washing guidelines. Most manufacturers have a section on their website of how to care for their diapers. Front loading machines need less detergent than top loaders. However, front-loaders often need more water for cloth diapers than top-loaders. Don’t use regular diaper rash crams while using cloth diapers. Use only cloth diaper approved creams, if necessary, or switch to using disposables while rash cream is being used. Using diaper rash creams while using cloth diapers can void a product warranty, so again, pay attention to manufacturer’s notes! If you forgot and did use a diaper rash cream with a cloth diaper, make sure you follow the instructions for stripping your diapers to remove all residue and build-up. Added by Cassie W. on November 2, 2012. I loved the article! great information and very helpful. Thanks! You may want to edit and add why people shouldn’t use regular rash creams Always important to know the whys when told not to do something Helps remember!